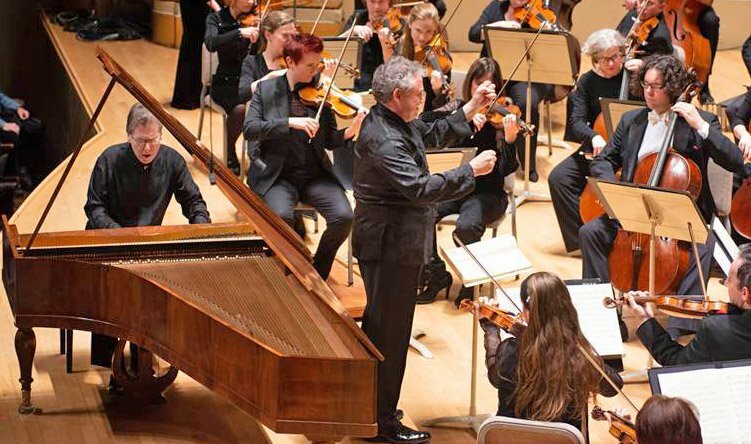 Heroic Beethoven and sublime Schubert made for deep thrills at the Handel and Haydn Society’s season-opening weekend at Symphony Hall, where British conductor Richard Egarr led the highly skilled period instrument orchestra. And in his beautifully restored 1830 fortepiano by the Viennese maker Conrad Graf, Levin found a worthy collaborator. This reviewer attended Friday. In the Vienna of 1809, threatened with bombardment and invasion by French troops, composers turned naturally to the popular style of military marches and fanfares. Yet in his fifth and last concerto, the “Emperor” in E-flat Major (the key of the “Eroica”), Beethoven alternated passages in grandiose, heroic style for full orchestra with exquisite filigree in the piano, nostalgic horn calls, and inspired passages for winds. Three fortissimo orchestral chords opened the first movement with stentorian calls to action. A cadenza-like flourish in the piano followed each orchestral outburst, pushing toward the extremes of the piano’s six-and-a-half octave ambitus and revealing an increasingly virtuosic assemblage of bravura scales, arpeggios, turns, and chords. One might have expected the piano’s sound to be swallowed in Symphony Hall; instead, its characteristic timbres through three discrete ranges — treble, middle, and bass — came through with astounding clarity. When the orchestral exposition began in the strings, horn calls heightened the distinctive rhythmic profile of the main theme before it was echoed in the clarinets and then the full orchestra. In the second part of the theme, crisp repeated notes in the timpani provided another kind of rhythmic definition. The piano exposition transported the main theme to a faraway sound world of ornamented melody, staccato chords in triplets, and onrushing scales. This feeling of distance continued through broad expansions into remote tonal realms heralded by a new theme in the piano’s treble range anchored by pizzicato strings, then basses alone, against a long pedal note in the cello. The development brought more magical moments in a series of dialogues, pianissimo, between piano and individual wind instruments. Apart from improvisatory cadenza-like passages in the piano, Egarr and Levin maintained an unflagging pace throughout the movement, executing thinner textures in syncopated rhythms and more thickly scored, rhythmically dense sections with equal aplomb. Sensitive attention to dynamics contrasted pianissimo in the piano and winds with aggressive unisons from the full orchestra. In the quiet, hymn-like Adagio that followed, the strings were muted throughout, and the warlike trumpets and timpani silenced, the horns for the most part joining the wind choir. In dialogue with the orchestra, the piano contrasted delicate staccato in the treble with pedaled arpeggios in the bass. Ornate arabesques, in which even trills became an integral part of the musical line, shimmered over held chords in oboes and horns. After a long and suspenseful diminuendo in the orchestra, the horns returned at the end, voicing a sustained dominant pedal as the piano, now pianissimo, anticipated the rollicking theme of the Rondo that followed. Here Beethoven’s perverse groupings and accents threw the 6/8 theme off kilter from the start, the rhythm only set to rights in a consequent phrase by on-beat pizzicato strings and horns. Throughout the movement, in dialogues with winds, pizzicato and bowed strings, and horn, Levin displayed his ability to elicit a variety of tone colors. Just before the end, after a big climax in piano and orchestra, another magical moment: the timpani entered with an ostinato figure, pianissimo, as the piano swooped to the top of its range, then slowly descended with chords in both hands before a final bravura flourish of octave scales, leading to a final triumphant statement of the Rondo theme in the orchestra. In response to enthusiastic cheers from the audience, Levin turned to applaud his fine collaborator, the piano itself. Schubert’s C Major Symphony (the “Great”) was his own heroic response to a desire to ensure his legacy in the important genres of instrumental music before what he must have known would be an early death. To the classical orchestra of strings, winds and brasses in pairs, and timpani, Schubert added three trombones, which allowed him to modulate to remote keys not available to natural horns without valves. He began composing the symphony during the summer of 1825, completed it in 1826, but was never able to secure a performance. Players found it too long and too difficult, objecting in particular to the prolonged repetition of small motives. And so it disappeared from view. During a visit to Vienna in 1839, Schumann visited Franz’s surviving brother Ferdinand, who showed him the manuscript. Schumann had it sent to Mendelssohn, who gave the first performance in Leipzig a few months later. In a letter to Clara after attending a rehearsal, Schumann wrote: “It is not possible to describe it to you; all the instruments are human voices; it is gifted beyond measure, and this instrumentation, Beethoven notwithstanding — and this length, this heavenly length, like a novel in four volumes . . . .” In the Leipzig Neue Zeitschrift für Musik (New Journal for Music) Schumann wrote: “Deep down in this symphony there lies more than mere song, more than mere joy and sorrow . . . ; it transports us into a world where we cannot recall ever having been before.” A performance of the symphony took place in Boston in 1849, but a complete performance in Vienna had to wait until December 1850, and it did not enter the orchestral repertory until the 20th century. Egarr took the Andante Alla breve of the Introduction fairly fast, ensuring that the opening horn theme and its four quasi-variations moved at two rather than four beats to the measure. Todd Williams and Elisabeth Axtell, in a sonorous unaccompanied horn turn, entered hauntingly as if from afar. Pizzicato strings accompanied the first variation in the winds and an episodic melody for cello. The brief second variation pitted the strings and brasses against the wind choir, while the third brought a sudden modulation, stretto imitations, and a fortissimo climax. In a final variation, triplets in the violins followed by syncopations in the winds marked the start of a feeling of a progression toward the climactic moment when a trumpet fanfare announced the approach of the first movement Allegro. Reporting on the performance he heard, Schumann wrote of this transition from Andante to Allegro as occurring “without our knowing how.” In other words, the speed of the dotted quarters that open the Allegro was equivalent to the speed of the dotted eighths of the Andante. Egarr held back slightly at the end of the Andante and then accelerated into the Allegro. The resulting tempo seemed just a shade too fast. The band met the challenge, however, and even at this tempo Egarr could build climaxes with urgency yet without undue haste. With the opening dominated by sharply defined dotted-note motives, the sudden shift from C Major to a relaxed second theme in E Minor invoked an entirely new atmosphere of light and clarity on a broad plane. Playing mostly in thirds, oboes and bassoons alternated with flutes and clarinets until the full orchestra took over. The tutti’s forte dissolved into a prolonged pianissimo, then a gradual crescendo over several remote tonal areas, punctuated by distant reminiscences of the opening horn call from the Andante, now in the trombones. Shifting down to A-flat Major, the development not only combined the opening bass ostinato with the second wind theme, but included increasingly urgent reiterations of the opening horn call. After an expanded recapitulation, a whirlwind Coda (marked “Più moto”) rounded off the movement with a final return of the Andante theme. Egarr’s energetic style and keen sense of musical logic earned him a burst of well-deserved applause, a throwback to a less reverential style of audience participation. Egarr chose a fairly fast march tempo for the second movement, which is in many ways reminiscent of the Allegretto from Beethoven’s Seventh Symphony. The performance was notable for its clarity of line, strong dynamic contrasts and accentuation, and subtlety of the pizzicato basses. The Scherzo is one of Schubert’s grandest, and Egarr took all the repeats, allowing us to savor the full expansion of its multiple themes and developmental episodes. The Trio, at the same tempo, seemed to take on a more leisurely pace, with longer phrases and strong downbeats. For the Finale, Allegro vivace, Egarr set a relentless tempo, one beat to a measure. As in the first movement, short motives were repeated in building blocks that added up to long passages. The opening, a grotesque fanfare consisting of two motives, could be heard either as first theme or as introduction. A second idea entered over a prolonged dominant pedal in the strings that was answered by horn calls, ending with a return of the opening fanfare and four insistently repeated chords in winds and brasses. Fragmentation of the fanfare, decrescendo, then fortissimo, and silence. Out of nowhere, four repeated notes in the horns, grotesque and insistent, introduced a new group of themes, one of them a possible allusion to Beethoven’s “Ode to Joy.” When Mendelssohn rehearsed this passage with the London Philharmonic, the story goes that the players giggled at the incessant knocking motive, and he had to withdraw the work from the program. Egarr and the Handel + Haydn made it all sound convincing, and one reveled in the exuberant progression of musical ideas that Schubert put forth. Does the 1830 Graf belong to Levin? Robert Levin has owned the Graf since 1994. I heard the Sunday performance of the Schubert 9th, and my main complaint was that the last movement was NOT relentless. Egarr persisted in varying the tempi, which vitiates the inevitability of forward movement toward the end. This was entirely different from the conductor’s maintenance of tempi in the Beethoven, and I can only conclude that he had some notion that Beethoven was Classical and Schubert was Romantic, and their tempo markings could be strict or approximate accordingly. This commenter was privileged to hear an exhilarating example of Robert Levin’s uncanny ability to slip inside the skin of the composer when he performed Beethoven’s 5th piano concerto, the Emperor,on an 1830 Viennese forte piano before a thrilled capacity audience of over two thousand at Symphony Hall in Boston on November 9, 2018 at the 2,428th concert of the over two hundred year old Handel and Haydn Society, playing on period instruments. Indeed, that combination of elements to which Robert Levin bestowed his active mastery of classical music language, playing in a lighter, more transparent, and somewhat less dramatic style heard, embellishments and all, by its first auditors, took us all on a time travel trip back to Beethoven’s time to live in an interpretation of the masterwork as never before experienced. That spell lasted until we emerged into the cacophony of sounds assaulting us on Massachusetts Avenue in the cold and rain swept November evening, but lingered affectingly in the mind for a long while after.